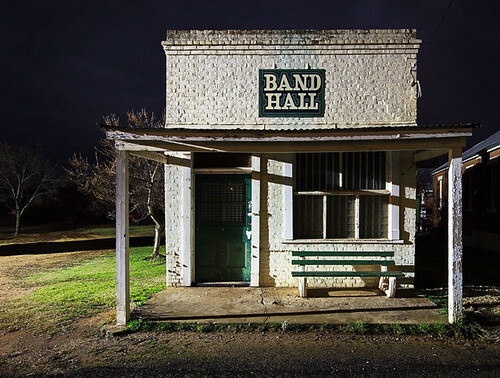 On my recent trip to Grenfell in the New South Wales central-west, I had the pleasure to photograph the Band Hall building. The uniqueness of it fascinates me and the unpretentious feel about it made me want to make an interesting photograph of it. 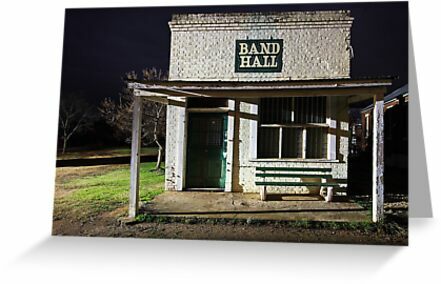 Located in George Street, the Grenfell Town Band rehearses in the rustic-looking hall. As I stood outside the door of my room at the Grenfell Motel, I heard them playing a few songs from years gone by. Can't remember what they were, but they sounded familiar all the same. I stopped to listen for a while and enjoyed the music as it drifted across Forbes Street in the darkness of the evening light. 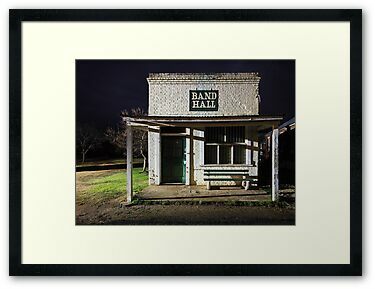 This photograph of the Band Hall at Grenfell is available for sale in a variety of quality print products. Purchasing is easy via the internet, and each product comes with a money back guarantee. If you are looking for a quality framed print to decorate a feature wall in a living area in your home, or a wall in your office, you will find framing, matting and size options to suit your budget. On my recent trip to Grenfell in New South Wales for the 55th Henry Lawson Festival of Arts, one of the opportunities I had was to distribute beyondblue information to local residents. To be honest, I had no idea how this would pan out. I left Melbourne with a box full of beyondblue information because I wanted to raise awareness about mental health. It was the first time I had attempted anything like this, and to my delight, everyone who I offered the information to gladly accepted it. Would be fair to say I was a little anxious about doing this in such an overt way, however I feel it went well. Walking around town with beyondblue bags over my shoulder wasn't exactly unnoticable, so putting myself out there was a hurdle I jumped. Sometimes I think to myself as to whether people are uncomfortable about accepting information relating to depression, anxiety and the like, but I think deep down they appreciate the thought behind it. Really, there's nothing to be afraid of in giving and receiving. We all know of someone who could benefit from it, so passing it on to someone else can be of benefit. It was said to me in Grenfell as to whether I wanted to be remembered as someone who talked openly about mental health, or as a photographer. Given I co-judged the festival's competition and was involved in hanging the images, conducted a photography workshop as part of the festival, and raised awareness about mental health, I am happy to be remembered for both. The trip to Grenfell was a breakthrough for me in more ways than one. I would like to think I made a positive impact in regard to raising awareness about how people can recover from depression and go on to helping others.